Note: Very shallow draft (22") resembled Mississippi river boats. 1905, Oct 21 Enrolled Grand Haven; to ply between Grand Haven, MI & Grand Rapids, MI with similar RAPIDS. 1908, Jun Owned Peter Vennema, Menominee, MI. 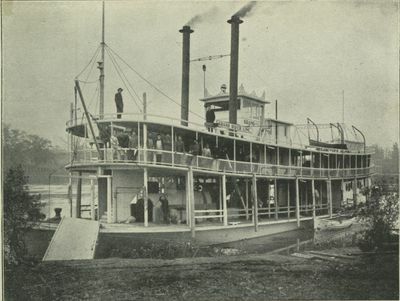 1909 Little Rock, AR owners; traveled to Mississippi River via Fox River; hauled rice in southern Louisiana. 1912 Owned Memphis, TN; 136.25 x 32.25 x 5', 124 gross / 116 net tons. Email your Order Comment on this item Create electronic postcard 1906. Grand Rapids, MI. Grand Rapids, MI. 1901 Grand Rapids, MI. detail detail Fox River at Green Bay, WI.